Homepage > News > Rising soon within Cebu I. Rising soon within Cebu I.T Park is Central Bloc — a mixed-use stacked development integrating commercial and leisure elements that perfectly cater to the Cebuanos’ budding urban lifestyle. It will have a 5-level shopping center, 2 BPO office buildings and a Seda Hotel. 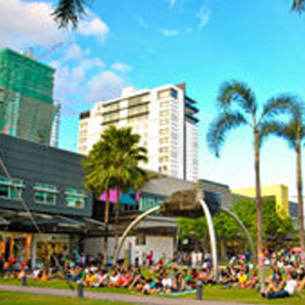 As a signature element of all Ayala developments – Central Bloc will also have an open park preserving the greenery and establishing a connection to the rest of the estate. Not willing to wait, come dine at the wide mix of dining options along the streets of Cebu I.T. Park. The Walk, Garden Bloc and Garden Row. We’re sure you’ll find something worth your visit.